This past Sunday I did a little foraging with my friend and one of the goodies we collected were black raspberries. They’re a little smaller than the conventional store bought variety, but pack a hefty nutritional punch and are quite tasty. Black raspberries are often referred to as the “king of berries” because of their superior health benefits. They are best known for their potent antioxidant and anti-cancer properties, and also provide anti-inflammatory and anti-tumor effects. Black raspberry supplements such as capsules, soft gels, and powders are a testament to their health promoting properties. Most people know about the antioxidant powers of blueberries, which are impressive. Black raspberries antioxidant properties (as measured by the ORAC scale) are three times higher! That’s some serious antioxidant power. Black raspberries get their dark pigment, which stained my hands when harvesting, from anthocyanins, often used as a colorant or dye, and responsible for their antioxidant awesomeness. According to research, anthocyanins help improve vision, heart health, and memory in adults. A quick aside, foraging wild edibles from your local environment is a very rewarding endeavor in my opinion. The initial allure for me was to procure healthier food and herbs. Wild plants have much more plant medicine and nutrition than the cultivated variety. Spending more time in nature, learning about local plants and herbs and the absolute abundance around me has proved to be quite fulfilling. I encourage you to do some foraging yourself. If you don’t have access to wild black raspberries, or even black raspberries, the good old red variety will do just fine for this smoothie recipe. Enjoy! Please leave a comment below if you try this wild black raspberry smoothie. Happy Blending! I made this smoothie this morning and wanted to let you know! It is very tasty! The only thing is that is was a little too thin for my liking. I used fresh wild black raspberries so next time I would either use frozen or throw in a frozen banana to make it thicker :) Thanks for the recipe! Thanks for sharing! I actually harvested more wild black raspberries yesterday for my smoothies. They are quite tasty indeed. When I made this smoothie it wasn’t as thick as usual for me either. I’m going to adjust the recipe to ensure a nice, thick, creaminess. 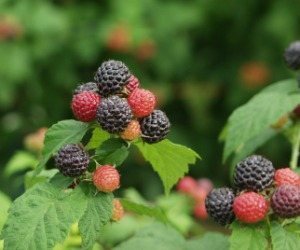 I am going to make a wild black raspberry smoothie today. We found this berry in our yard. We were trying to find a recipe for a smoothie with them and I think I have the perfect one.I hope I like it. I wish I had wild black raspberries growing in my yard ;) They’re one of my favorite foods ever! Hope you enjoy the smoothie, Kelly. I added oats and peanut butter which made it thicker. Good recipe! Oats and peanut butter, nice add-ons, Mary!